A hex-based take on a grimdark future. What is it? A 4X strategy game set in the Warhammer 40,000 universe. As I start my final assault, I wonder if there’s a chapter in the Space Marine tactical codices on moving in hexes. It quite suits their methodical murder-all-heresy style. One by one, I move squads of bread-and-butter tactical marines into a front line. Then I pepper the line with close-combat captains and damage-boosting chaplains, and bring up a few predator tanks from the rear. With each turn I send them on a plodding death-march across the entire map. It’s more relaxing than a Warhammer 40,000 turn-based 4X strategy game should be. In my first game the Orks are wiped out before I start putting my full army together. The human Astra Militarum forces offered a little bit of resistance until my dreadnoughts punched all of the hitpoints out of their tanks. After several turns spent punching and shooting the central tower in their base, they were gone. The robotic Necrons—the fourth playable race—put up even less resistance. Gladius - Relics of War is a solidly made strategy game, but a bland one. The UI for basebuilding, troop production and movement is clear and intuitive, but you’re not asked to make any difficult decisions as you build up your fortress to generate more resources. The tech tree simply asks you to research two technologies from a small selection before you access the next tier, giving you a clear, if simplistic choice, of which units and buildings you want to prioritise. 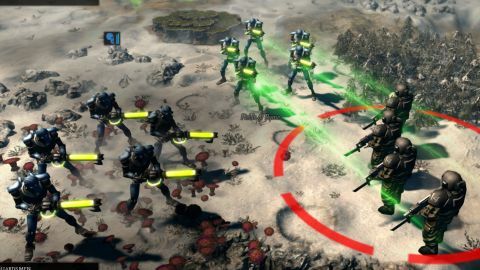 The four playable factions have a series of mission objectives to complete to win a game, which tend to involve researching particular technologies and moving specific units to a point on the map. This tells a loose story about the planet Gladius, but you’re likely to wipe the other factions out before you get close to its final stages. In a universe in which there is famously ‘only war’ it’s difficult to come up with a sensible diplomacy system, so there isn’t one. Gladius - Relics of War is all about producing units and moving them around though, as with base building, the troop production and combat systems aren’t particularly deep. Fans of hex-based Warhammer 40,000 games might remember the challenging Rites of War, which called back to meatier wargames like Panzer General 2. Gladius ain’t that. Units have attack, defence, armour penetration and morale values, but if you build a big clump of every unit you can unlock and push the army forward, you won’t have to worry about most of those stats. Orks have loyalty problems to reflect their rowdiness, Necrons regenerate a little bit of health each turn and can teleport to cities, but most of the differences between each faction are minimal. They all have combat specialists, basic line units, anti-armour options and a smattering of heroes who level up over time and unlock abilities. Normally these consist of a big hit on a cooldown, a ranged poke, and a passive faction wide resource boost. Whatever the faction, you produce as many units as you can, put them in a big line, and move them at the enemy base. I wouldn’t mind the game’s simplicity if it captured more of the spectacle of Warhammer 40,000. The units are faithful to the tabletop originals but in motion they are stiff and mostly unexciting to watch. Grenade attacks looks like one unit is hurling a bunch of rocks at another, and when members of a unit die their bodies sink awkwardly into the ground and vanish. Enemies can behave oddly too. They tend to fall back when damaged, but will sometimes come right back and fight you even if they haven’t recovered. I haven’t seen the AI make any structured pushes on my base, which adds to the feeling that you’re just there to mop up the map. Maybe some bigger explosions would help the ponderous exploration section, which you spend exposing procedurally generated terrain and blasting local insects. There are resource points scattered around that you can capture, and ancient relics that provide army-wide boosts to speed, damage or sight range, but the planet gets samey after a couple of games, and without the depth of a full-fat 4X game, it’s not as replayable. Perhaps with updates and expansions it will gain some complexity and nuance, but until then unless you truly adore the setting, play Endless Legend instead.